We found 3 main improvements companies were not meeting. Absorption, Purity & Freshness. For purity, Skinny Bean uses a cold press liquid-liquid extraction. For absorption leading to faster results, we take twice as long to pulverize formulas to achieve an ultra-fine 2X Grind. For freshness, each bottle with our made to order process. This means when you place your order your bottle is made and sent. You can smell the freshness. For you, we wish to commend you for wanting to better yourself. Skinny Bean hopes to give you an advantage in your personal body transformation. Advanced Ultimate Thermogenic Fat Loss Formula Boosts Metabolism Helps Control Appetite With Green Tea Extract and Raspberry Ketones. Battles against belly fat and reduces cravings. With Yohimbine this increases adrenaline and natural energy levels. Plus Caffeine this increases cognitive function and increases focus and energy levels. 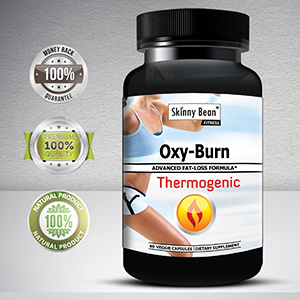 Every ingredient inside Oxy-Burn Thermogenic Fat Burning pills is hand-selected for its ability to cut fat while preserving muscle, all while enhancing cognitive function for both women and men. You will burn fat faster while highlighting the muscle. Ingredients: Energy and Focus Blend: 450mg ** Caffeine, Phenylethylamine HCl, Glucomannan Fursultiamine, L-Tyrosine | Thermogenesis Blend 40 mg ** Green Tea Extract (min. 50% EGCG, min. 98% Polyphenols)(leaf), Raspberry Ketones Yohimbe bark | Lipogenic Blend 7 mg ** Kola Nut, L-Carnitine. Boosts Metabolism Helps Control Appetite. Green Tea Extract and Raspberry Ketones - Fights against belly fat and reduces food carvings. Yohimbine - Increases adrenaline and natural energy levels. Caffeine - Increases cognitive function and increases focus and energy levels.